Santa Barbara Target: Hooray! or Huh? After the news that Target intended to open a store in October 2018 flashed around Santa Barbara last week, jubilation soon turned to questions: Why is it at the Galleria at State and La Cumbre and not downtown? Who told them it’d be finished so quickly? Where will the expected hordes park? It’s going to be how small? The stores in Target’s development portfolio currently range in size from 20,000 to 60,000 square feet in confined urban spaces from Los Angeles’ Koreatown to Manhattan’s Hell’s Kitchen. The Galleria spot is 34,000 square feet, tiny compared to the stores in Ventura and Oxnard, which have retail floors of 220,000 and 150,000 square feet, respectively. “In a location like Herald Square,” explained Erin Conroy, a spokesperson for the company, “a 120,000-square-foot store doesn’t make a lot of sense.” The company was interested in store growth and “reaching new guests,” said Conroy, expanding its presence rather than responding to the competition of online sales. Nonetheless, Target stores have a symbiosis with online sales. Conroy said that during November-December, about 70 percent of online sales went to a customer from a nearby store or the customer picked it up. They looked online before shopping in-store, she said, and often ordered online later. 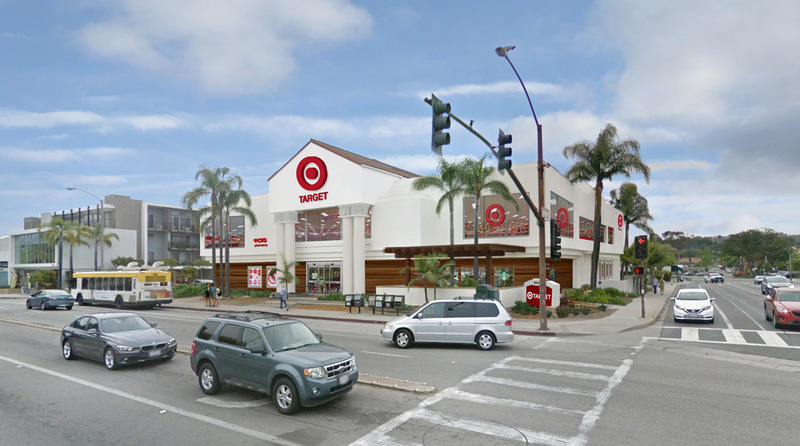 Through real estate investment firm Gryphon Capital of Manhattan Beach, Target had been searching Santa Barbara for many months, said Liam Murphy, a broker at Hayes Commercial, including perusal of the Saks building downtown. The company had its own real estate team and didn’t talk about why it was not considering Macy’s or Sears at La Cumbre, he said. Conroy also deflected such questions. Gryphon acquired the property from Watabun USA — which was planning apartments there — for $12.55 million in mid-December. The city has only been in conversation with Target’s land-use team for a couple of months, said planner Renee Brooke. “You have to understand,” she said, “they haven’t even submitted for permits yet.” The Galleria choice allows Target to file a like-for-like redo — one retail zone for another retail zone — and inherit the legal non-conforming benefits. A new retail development of 34,000 square feet would have required 136 parking spaces. The Galleria has 103 parking spots on-site, said George Buell, the city’s head of community development, and 15 more currently behind the Grace Village development. Target plans to fill in about 1,000 square feet of the interior space and do an exterior facelift. The new square footage requires Target to add a few parking spaces, said Brooke. Additionally, the parking lot must be redesigned to accommodate Target’s delivery trucks, said Brooke, and a left-turn lane off La Cumbre Road was being engineered. Design review could take place by late January or February, she thought, and though Target projects an October opening — they often open a store in October, she noted — more realistically, it might be closer to one year from now. Editor’s Note: This story was corrected on January 12 to indicate that Target acts on guests’ comments related to merchandise; it also added that it is a CVS pharmacy that will be in the store.